Is there a single machine I can get to destroy everything? Look through a catalog or web site for high security information destruction devices and you’ll find so many types of machines: shredders, disintegrators, crushers, grinders, and more. Some machines handle one type of material, like just CDs and DVDs for example. Other machines destroy two or more kinds of media. 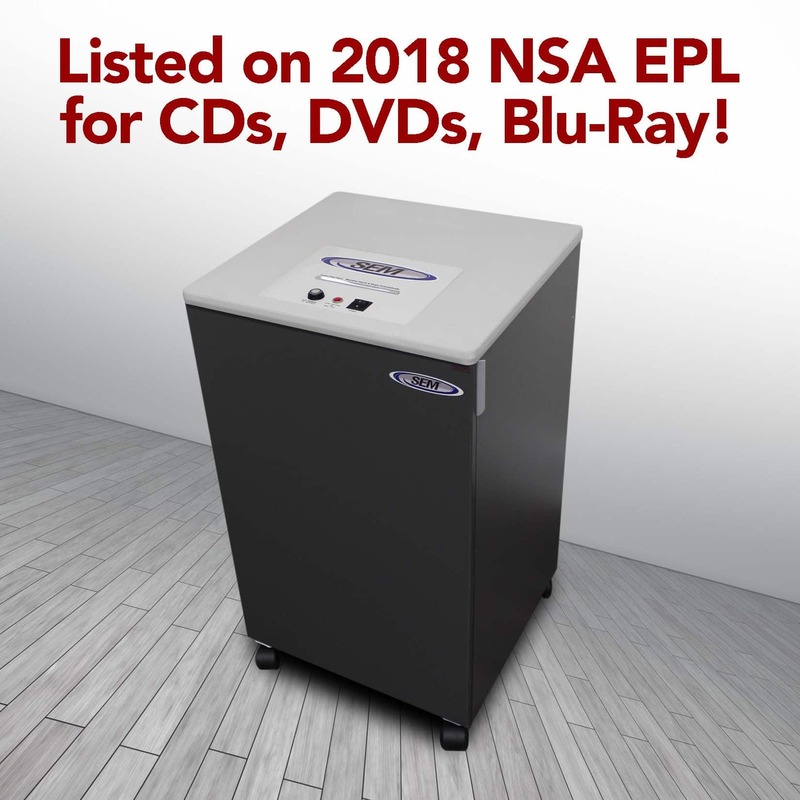 Office Shredders– these machines are great for paper documents and there are high security models that are NSA approved at the highest level. But the highest security versions can’t shred anything but paper. Yes, there are combo machines that also shred paper, but the high security models are really two shredder heads in one cabinet. Even more problematic, these machines can suffer severe, costly damage if an operator accidentally feeds a CD or DVD into the paper-only feed slot. Office Mixed Media Destroyers– these are small, knife mill disintegrators. They offer some useful capabilities, including three separate NSA listings (paper documents, CD/DVD, and key tape). Plus, they destroy a huge range of other items, like flash memory, thumb drives, cell phones, small tape cartridges, and lots more. Seems like a candidate for doing it all, right? Well, not quite all. Paper throughput for office disintegrators is only 5-6 sheets every 10 seconds. Even a very small high security paper shredder can beat that. These machines can’t accept heavier items, like hard drives or large tape cartridges. So, still not the answer for everything, but still very useful for many applications. The Model 200 Mixed Media Destroyer is ideal for the destruction of a wide variety of media including cell phones, flash drives, computer backup tapes and much more. Full Sized Disintegrators– these are big, industrial style machines that use the same cutting method as office mixed media destroyers. It seems like they could be the all-in-one answer. They are a great choice for many high volume mixed media requirements. These machines can take larger items, like bulk paper documents, bound books/manuals, full tape cartridges, and more. But, they can’t destroy other things, like whole hard drives. And, they won’t fit everyone’s situation. In particular, not everyone has the right location for these machines. They are not office machines. They need an isolated location and high voltage electrical supply. They also need more training or supervision than office machines. The best answer to the “everything machine” question is that there isn’t a single perfect machine that can destroy all types of information bearing media at the highest security levels, let alone one that is office friendly and affordable. What to do about that? Make a careful study of the types and quantities of materials needing destruction. Determine the types and numbers of likely users. Then, select the 2 or 3 machines that can best handle the requirements for your particular needs and situation.